When we live in water-centric communities it can be difficult to seriously consider the possibility of ‘running out’ of water. Sure, at times we entertain the idea of ‘roughing it’ with the heart of an adventurer and find ourselves camping for a weekend in the woods, crossing the country in an RV, or even traveling to outer space. We welcome these ideas because we know they are short-lived, and we can always return to ‘normal life’ and bounteous water whenever the romanticism wears off. Or can we?!? It may seem absurd at first, but what Commander Hadfield points out is that conserving water, food, energy, or any vital resource on earth is no different than the conservation required in any of those ‘romantic’ situations. Planet Earth is, in essence, an ISS, an RV, a tent in the woods… the water resources are finite. Moreover, what makes the situation on earth direr is that, unlike a short-lived water-limited adventure, the demand for water is increasing as the population and industries grow. The ISS sustains six astronauts, and they always know how many people they have at any one time. Therefore, they know what the demand will be and how best to allocate their resources in order to also conserve their resources for survival. On Earth, we are not sure how to calculate the demand, nor how far the water will have to be transported from the “sweet spots” in order to meet the demand. So how do we make sure there is, and will be, enough water to go around? The answer is: with awareness of the situation and careful balance, with respect for the systems already in place to conserve water and maximize the efficiency of its usage, by being visionaries who see challenges before it’s too late and act proactively, and with a concentrated effort to evolve our water technology and capabilities in a way that outpaces demand. 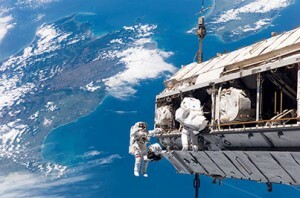 With an astronaut’s perspective, perhaps we can become better passengers on spaceship earth. Thoroughly enjoyed the intertwining of the current and projected physiological need to the individual and community consciousness.